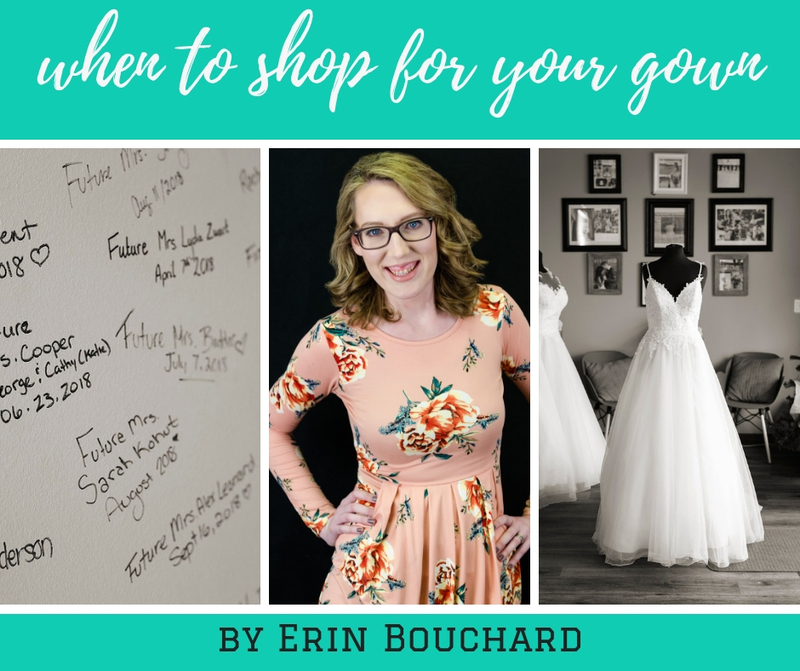 Owner Blog | When To Shop For Your Gown. We’re seeing this trend in the store right now, of brides putting off coming in to shop for their gown. And while sometimes we can make magic happen and find a gown that fits them or rush a gown in fast enough, it definitely limits your options as a bride. At the bridal show a few weeks ago we met some brides who did not want to shop for their gown until much closer to their wedding. And I get it, it can feel overwhelming or you might feel like if you shop too early you’ll have dress regret. However, wedding gowns take between five and six months to order in. In order to have the most number of options of gowns to choose from, you should begin shopping for your gown about seven to nine months before your wedding. Earlier is even better because that will give you time to enjoy the process and help everything else fall into place. Because the worse thing that can happen is that you have to settle for a gown that fits you and you can buy off the rack instead of saying yes to the gown you absolutely adore. Here’s three reasons we see brides delaying shopping for their gowns and how to overcome them. Some brides are putting off shopping for their gown because they are afraid they may have dress regret. They may even have a friend who ended up purchasing two gowns for their wedding day. Here’s the thing about dress regret, if I can speak openly for a minute. We live in an instant world. We instantly have our emails on our phone, we instantly can connect with someone half way around the world on facetime, we can get something delivered the next with amazon prime. So we’ve become accustomed to not waiting. So when we purchase a wedding gown, and my goodness, we now have to wait five months for it to arrive, it’s hard! I get it. I do. So if you start to second guess yourself or worry about your gown, do this: First, think about all the reasons you loved that gown and said yes. Remember how you felt in it. Remember how it will look with all your alterations done, with your hair and makeup done, walking down that aisle to the love of your life. Second, if that doesn’t work and you’re still worried, do not go shopping. I repeat, do not go shopping. Wedding gowns are beautiful. They are made to be pretty. You will find another one you love. Instead head back to the store you purchased your gown, slip that gown back on and remember why you fell in love with it. This one can be a bit tricky. Because it’s obviously a sensitive subject. Brides want to look their best on their wedding day. And while we’re all for feeling beautiful, we want to make sure you can still have the dress of your dreams. We can talk through sizing and alterations with you in the appointment. But the thing here to remember is that your fiancé fell in love with you and proposed at the exact size you are right now. Don’t put too much pressure on yourself in an already stressful season of life. Embrace the shape you are and find a gown you love right now, not 20 pounds lighter. If you are determined to lose a bit of weight, then give yourself some time. Set a goal and track your progress. That will help us choose the best size for you when you do shop. We get it. You want your people there when you have your magical experience. So sometimes brides will put off shopping until their mom is home or sister is back from school. We totally understand. Just make sure that it still leaves you with the suggested time frame of 7-9 months before your big day. If it doesn’t then plan an appointment at a time that they are available and we’ll facetime them into the appointment. This way they can to still be part of the experience and you still get all the gown options. Then we can also do a bridal reveal the next time they are home or in this area. You can slip that gown back on and show them and have them help with accessories. We want you to say yes to the dress in absolute confidence. We want you to love your gown and continue loving it until long after your wedding day. At Once Upon A Time Weddings our goal is to walk with you through the whole experience. That’s what makes our store different. We know from past brides that once your gown decision has been made, so many other decisions are able to fall into place. If you’re still looking for your gown, register now for our upcoming webinar on Wednesday November 28th at 7pm. In it, we’ll cover the 5 things you must know before you say yes to your dress. If you’re ready to start trying gowns on, book your exclusive gown finding experience here.